Every month we use Google Analytics to provide clients valuable insight on how they can improve their content marketing strategy and their conversions. It’s the most accurate and cost-effective digital analytics tool available, and it helps us provide continual website growth for our clients. However, its biggest strength can also be a crutch. It’s a huge space. There are a lot of bells and whistles and interesting metrics that are available. Its data is hypnotizing, and without a structured approach, you can find yourself drowning in information, ultimately slowing down your workflow. 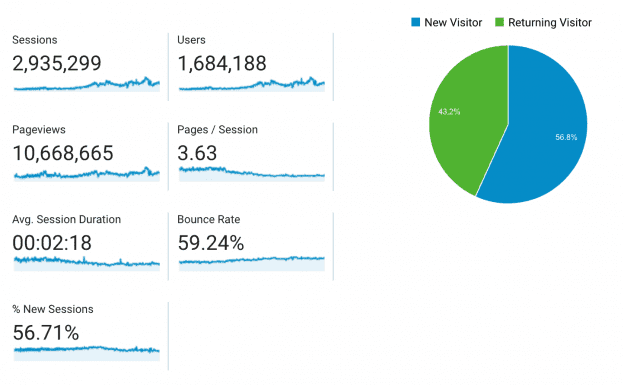 Below we highlight 9 Google Analytics metrics that you can focus on, allowing for you to become more efficient while also helping you improve your content marketing strategy along the way. Before planning your next content marketing strategy, you’ll want to identify where your leads are coming from. With the Google Analytics locations report (Audience > Geo > Location), you can break down traffic maps and pinpoint geographically the regions that react best to your content marketing strategy and which regions do not. This metric also helps you identify both maturing and emerging markets as well. So if you’re looking to expand, you can focus on a target hot spot in your map, and tailor your content marketing strategy specifically for that region and culture. The recency report (Audience > Behavior > Frequency & Recency) offers insights on how often users return to your site across different devices through time. You can view the number of days that pass and how long it takes for your users to come back, before clearing their cookies. This insight gives you a good idea on how to manage your content marketing strategy from a publishing point of view, including your email and social media marketing campaigns. This report provides you insight on how you can bring back visitors more frequently and when you should send out content marketing blasts that’ll keep your fans coming back for more. When you’re marketing content, you want to understand your most effective sources (Acquisition > All Traffic > Sources/Medium) which pull in digital leads. Whether it be from organic search or pay-per-click campaigns or social media referrals, the sources report lets you know your content strategy source strengths and weaknesses and how you should prioritize your content. If you’re using any advertising have them add the source and medium variables into your ad links. You can drive lots of traffic from all different sources, but, if your landing pages have high bounce rates then everything is irrelevant. The bounce rate is the percentage of visitors who land on your site and leave without viewing any other pages. A high bounce rate typically indicates that your visitors fail to find the content they were looking for. A good way to reduce your bounce rate is to ensure that the content on your landing pages match what you market on the web. You can also add a strong call to action on your landing pages as well, improve readability, avoid long chunks, and optimize your overall brand storytelling. According to HubSpot, the average visitor spends about 15 seconds on a website. Unfortunately for many website owners, it takes a lot longer than that to convert visitors. Use this Google Analytics metric to figure out how long users spend on your landing pages. If you’re working with time-sensitive goal conversions, you’ll want to identify the landing pages you want your visitors to spend more time on. Then, you can compare this metric with the bounce rate metric and figure out how engaging your pages are and what you need to do to increase the amount of time they spend on your landing page without bouncing. You can also identify the pages with the longest duration and use it as a benchmark for other pages. But remember, your goal is to provide users with a positive experience. For all pageviews, the exit rate is the percentage of visitors who exit pages as its last session. Many people confuse this with the Bounce Rate, which is the percentage of exits that were the only one of the session for one page based on sessions that start with that page. Exit pages are important to study because it gives you a list of last session landing pages that you can optimize to improve conversion. This is a feature in Google Analytics (Behavior > In-Page Analytics) that highlights your landing pages and showcases the most popular and least popular spots users click. This metric also gives you an opportunity to set landing page benchmarks, meaning you can replicate the design for other pages on your site. You can also test with different design templates, calls to actions and buttons to see what your audience feels more inclined to click through for conversion. Social media (Acquisition > Social > Overview) is a great platform for gaining insight on user ‘likes’ and ‘dislikes.’ When you measure your main social media channels like Facebook, Twitter, LinkedIn, Pinterest, and Instagram you can identify the types of posts and headlines that work best for each channel. You can also set the value for each piece of social media content as well, which shows your clients how much value social media content brings to the table. Take a look and discover the topics that resonate with your target audience per channel. There’s a study by Online Graduate Programs that shows compiled data about Amazon Page load time and how if one page slowed down for one more second, Amazon would lose $1.6-billion in sales per year. Average page load time is huge for conversion. Digital prospects are impatient, and if your site fails to deliver what they expect, they’ll jump over to the competition. One of the first things you want to do before rolling out your content strategy is to find the average load time (Behavior > Site Speed > Overview) of your website on Google Analytics. Google considers anything over 10 seconds as ‘long’ and will take that into account when ranking your website. 47% of people expect a website to load within 2 seconds, but, ideally, every website should have a maximum of 4 to 5 seconds tops. The faster, the better. When you learn how to use Google Analytics and its data sets to your advantage, you’ll be able to improve your content marketing strategy, optimize each landing page, and improve your workflow. The 9 Google Analytics metrics we listed above aims to help you gain insight on how you can acquire prospects through content, improve user engagement, and drive desired outcomes for your brand.